Surf Stars Penthouse and ground floor Studio is freshly renovated with high ceilings, corner full ocean view. Sunny balcony with stunning ocean views. Large entertainment kitchen with center island, bar stools, dual Euro-Lounger couches, adjustable Plasma TV. Two full baths with two bedrooms. Below is our brand new ground floor beach studio is perfect for a couple or small family. 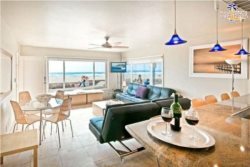 Located just 10 seconds from the ocean but full ocean view from kitchen and dining table. Full kitchen along with dining for 4, living room with 1 full Euro Lounger couch reclines into a bed, nice sized master bedroom with queen bed, closet, etc. The address is 714 & 716 York Ct. - The combo comes with an enclosed electric garage, washer & dryer, additional large parking spot, ground floor patio with BBQ, chairs, table and umbrella --- the roof deck is large and private loaded with chairs, tables, umbrella and natural gas BBQ. 2 minutes walking to the best restaurants, coffee, shopping, rentals, bars, attractions and especially Mexican food! Each bedroom opens to another balcony which leads to a spiral staircase for use of the 360 OUT OF THIS WORLD Private Roof Top Deck! Deck is loaded with chairs, umbrella, two dinning tables, natural gas BBQ, LED cabana lighting, center tiled island and ample casual outdoor seating. The view includes full Mission Beach ocean, Mission Bay, La Jolla and south to Belmont Park. Includes enclosed garage parking, high speed WIFI, high def TV in every room. This property is a 4 star rated Penthouse less than 10 seconds from the ocean.